A large part of Ligonier PA’s history has to do with Fort Ligonier, which played a significant role in the British victory over the French and Indians during the French and Indian War. During the 1750s, tensions rose between the French and the British over who had claims on the land that now comprises the middle of the United States. On October 12, 1758, the French and Indians attacked Fort Ligonier with a force of approximately 1,200 Frenchmen and a few hundred Native Americans. When it became clear that they were defeated, they retreated back to Fort Duquesne in French territory. When the British followed them, they found that fort had been set on fire—a sure sign that the French had accepted their defeat and given up. Later, Fort Ligonier would come to be known as the gateway to the West, as its acquisition made westward expansion possible. Today, Ligonier PA celebrates the rich History of Westmoreland PA in a variety of ways, including the popular Ft Ligonier Days Ligonier PA festival, which includes reenactments, a parade, live music, a variety of food, craft shows, and more. Visitors can also explore a restored 8-acre section of Fort Ligonier. Inside the 200-square-foot fort, you’ll find reconstructed features like the officers’ mess, barracks, quartermaster, guardroom, underground magazine, commissary, and officers’ quarters. Outside, you’ll see various structures, including a smokehouse, a saw mill, bake ovens, a log dwelling, a forge, the Pennsylvania hospital, and General Forbes’s hut. One of the best known historical figures to visit Fort Ligonier was a young George Washington, whose military prowess brought him renown during his days as a colonel, and later a general, in the French and Indian and Revolutionary Wars. At Fort Ligonier PA, he was involved in an unfortunate friendly-fire incident that occurred when two different regimens attempted to surround a group of French and Native Americans who they believed where trying to steal their cattle and horses. The incident left 38 soldiers dead or missing, but despite this tragedy, it gained the British army the intelligence they needed to capture Fort Duquesne, which set the stage for the British victory. 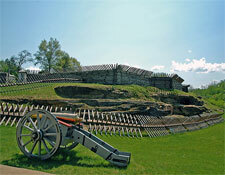 During its 8 years of use, Fort Ligonier was never once taken by opposing forces. It has become a symbol of both the community’s and the country’s determination and reminds us all that we can succeed in the face of adversity. Today, Ft Ligonier Days Ligonier PA is a popular local festival that celebrates the History of Westmoreland County PA. Countless people visit the community each year to take part in the festivities. The many people who travel to Ligonier PA to partake in Ft Ligonier Days Ligonier PA stay in the great Lodging in Westmoreland County PA and enjoy delicious meals at the many Restaurants Ligonier PA. They might also decide to take part in some of the exciting recreational activities that can be enjoyed throughout Westmoreland County PA, like Fishing in PA at the numerous PA Fishing Lakes and PA Fly Fishing destinations, Kayaking in PA down the many rivers and streams that flow through Westmoreland County, ATV Riding in PA, Snowmobiling in Pennsylvania, Cross Country Skiing in PA, Hunting Deer in Pennsylvania, or exploring the Pennsylvania Hiking Trails that twist and turn through the many State Parks in Pennsylvania that can be found near Ligonier PA. Whatever your favorite outdoor activity is, you can find something to occupy you in Ligonier, so head to Ligonier Outfitters to stock up on fantastic Orvis Fishing Equipment, including Orvis Hunting Vests, Orvis Fly Fishing Rods, Orvis Women’s Clothing, and even that perfect Orvis Spinning Rod.